The first bottle of bubbly was well on its way to empty as our Mercedes merged onto the 101 freeway, barely five minutes into our trip. Not to worry. There was another bottle already on ice, so I could quickly pop the cork for nearly-instant refills. With nine glasses to keep filled, you've always got to be thinking one bottle ahead. Pouring, not driving, was my chief responsibility for the day. I guess it was a rookie move to pick the seat closest to the bar in a wine-tour limo - just one of the many things learned during a daylong excursion through the Paso Robles wine country with my extended family. The Northern and Southern California branches of the clan had converged in Pismo over a long holiday weekend. To get us all out of the house after two days of eating, my parents organized our adventure with the help of Elegant Image Limousine, which ferried us to five unique destinations in and around Paso Robles. First up was Tobin James Cellars. 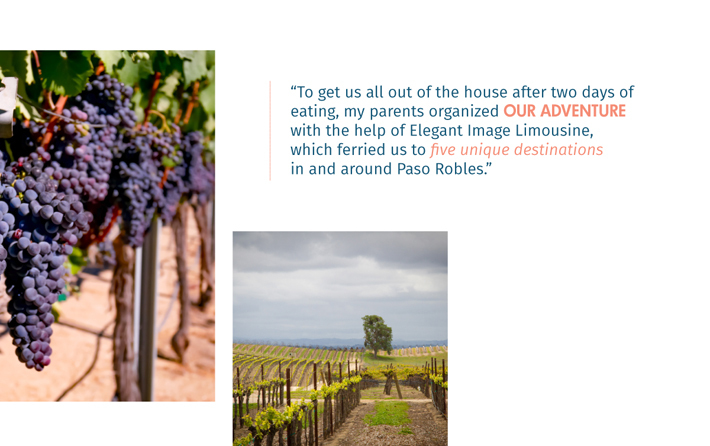 It's a popular stop for Paso wine tourists, partly because of its proximity to town, but also because of its relaxed attitude. Built on the site of an old stagecoach stop, Tobin James is true to its frontier roots with a setting that is more Western saloon than wine snobby. "The only rule in our tasting room is have fun!" the menu proclaims. We did just that, laughing and joking with our server as he guided us through the tasting menu and even poured some of his favorite concoctions that were not on the menu. Back in the Benz, we headed for Pear Valley, a beautiful winery and vineyard just off Highway 46 east of Paso Robles. The bar was busy and we soon discovered why. They specialize in reds, and I particularly enjoyed the merlot and tempranillo, both from 2014. The meatballs in the crock pot were also tasty and my stomach welcomed something other than wine. After a picnic lunch on the shady lawn at Villicana Winery and Vineyard, we took a beverage detour and stepped into Re:Find Handcrafted Spirits, which claims the distinction of being the first distillery opened in San Luis Obispo County since Prohibition. Rather than distilling potatoes or grains to make vodka or gin, Re:Find uses the excess juice from the winery's grapes that is removed before fermentation to help concentrate flavors. Known as saignee, it is triple distilled to create a smooth vodka. They also finish the vodka in rye whiskey barrels to create what they call [e], which looks, smells and tastes like traditional whiskey, but with its own distinct character. The Paso Robles area also happens to be an ideal climate for growing olives, so we visited Pasolivo's orchard location for a tasting. They pour a variety of flavored oils and balsamic vinegars to create unique flavor combinations. We ended the day at Tin City. If your time in Paso is short, and you can only make one stop, make sure this is it. The cluster of small industrial buildings tucked between the 101 freeway and the railroad tracks houses 21 different craft beverages, including wine, beer, cider and spirits. Simply park, wander and taste. And, be sure to bag some bottles to go. Eric Harnish lives in Castaic.